"cake", and no I didn't eat both of the éclairs. The older we get, the more painful birthdays become, and the less likely we are to celebrate birthdays or make any fuss about them, like having a party or receiving gifts. Where did this idea of celebrating a birthday come from? That question prompted some searching. Celebrating birthdays was a pagan ritual that dates back to at least ancient Greece. Because of the birthday being linked to paganism, Christians were slow to warm to the idea of celebrating the day of their births. Evil spirits were believed to linger about days of important change, like the day you turn a year older, and from this eventually sprang the idea of incorporating candles in the celebration to bring light into the darkness. The Germans were credited with starting the tradition of celebrating children’s birthdays in the 1700’s and having a party, called a kinderfeste, and incorporating a cake or torte with a candle for each year of life. 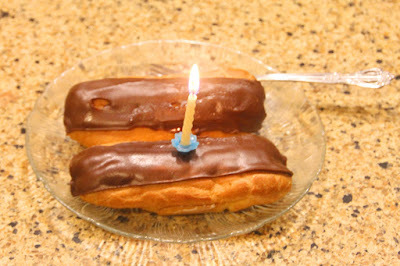 Somewhere around the time the candles are blown out, everyone usually starts singing “Happy Birthday to you,” the most commonly sung song in the English language according to Guinness World Records. This music was written as a song for school children. The original lyrics were “Good morning to all.” In 1893, two Kentucky school teachers, Patty and Mildred Hill, wrote the song and incorporated it in a book of songs for school teachers. No one knows when or how the lyrics were changed for birthdays, but it first appeared publicly in a 1933 musical by Irving Berlin. One of the Hill sisters sued Berlin for copywrite infringement and won. The copyright is believed to remain in force until 2030, and the Hill estate still receives roughly two million dollars a year for its use, so make sure there are no copyright attorneys at your next birthday party before bursting into song.